AT MORE than one dollar a sip and $600 a carton Moorilla's newest brew is anything but the typical drink. That's especially the case for those looking to find solace in during a global recession. 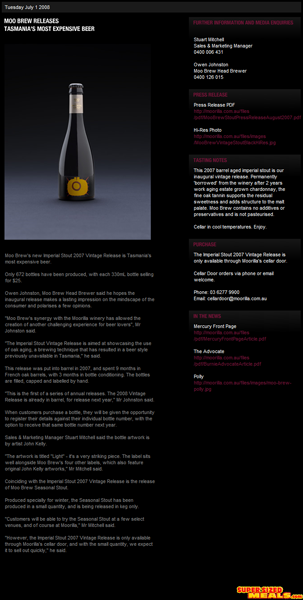 But devout beer lovers are defying the economic gloom and buying up big on Moo Brew's 2008 Vintage Stout at $25 per 330ml bottle. Last year's inaugural production of 672 bottles saw Tasmania's most expensive beer sell out in just eight days. This year production has more than doubled but is again limited, with just 1515 bottles produced. And despite celebrating its release only yesterday sales have already surpassed last year's with about 850 pre-ordered, which has not surprised Moo Brew head brewer Owen Johnston. "Some people are buying for drinking sake and others are buying for collecting, but either way our clients are deterred by price or the economic climate," Mr Johnston said. And it's worth every dollar Mr Johnston assures. "This year's brew is definitely better than last year's -- we've used the same recipe but have tweaked it a little," he said. "The flavour on the palate has gone through the roof this year; it is a really big beer. "It brings a range of flavours from different roasted malts right back through to chocolate, toffee, biscuit and toast. "We have refined the process and the response has already been overwhelming." The 500L of Imperial Stout produced, worth about $37,800, has spent nine months in French Oak Barrels, with three months in bottle conditioning. The bottles are individually numbered, filled, capped and labelled by hand brewing team. Last year consumer who bought bottles were given the chance to register their details against their individual bottle number with the option to receive the same number this year, which Mr Johnston said had been a popular choice. "Almost everyone who made a purchase last year has made a purchase this year," Mr Johnston said.